Who is Koji Morimoto ? Koji Morimoto was born in 1959 in Japan, and graduated from Osaka's school of design in 1979. Koji started his career as animator for the studio Annapuru, on the series Tomorrow's Joe. Later, he worked as animation director on the feature Akira. 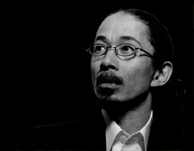 He founded Studio 4°C with Eiko Tanaka and Yoshiharu Sato. He is now focused on his director work. Koji Morimoto's double page represents a woman (from the future?) which reads the book, while little fairies flies around it. The drawing is black, with some red colour on the sketchbook.